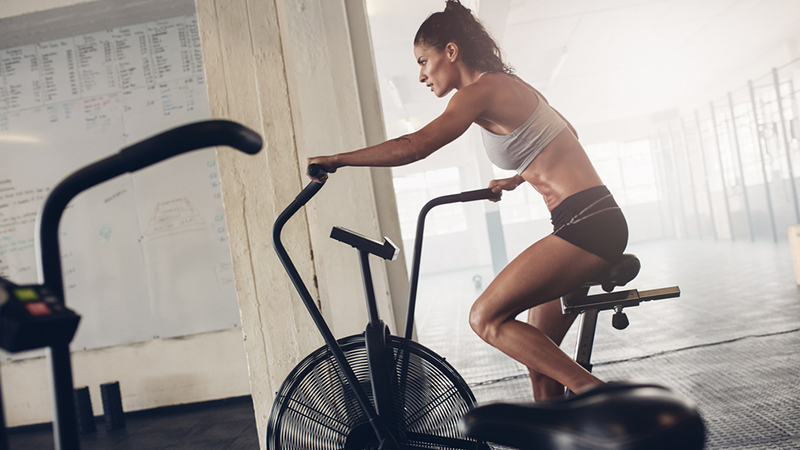 Indoor cycling, a.k.a spinning, is a fabulous way get improve your cardiovascular fitness while building up your hamstrings, glutes and core muscles. However, for those of us with uncompromising schedules, it can sometimes be challenging to attend our spin classes at their designated times. When you’re feeling the crunch, take matters into your hands and do it yourself with this 60-minute, indoor cycling/spin workout. Filled with challenging sprints and climbs, we’ve even included the perfect spinning music playlist for you to pedal to. All this workout requires is an MP3 music player and access to a spin bike. 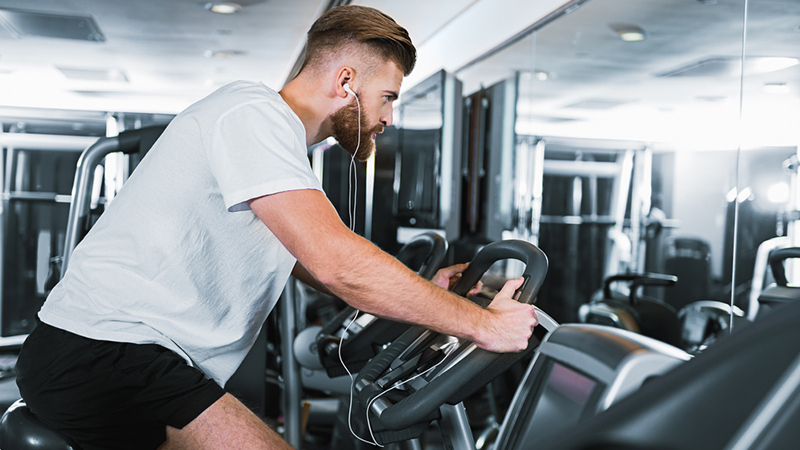 Because there are many different types of bikes across gyms, resistance levels aren’t always indicated the same way on all models. As a result, the levels of tension for this workout are described using a scale of 1 to 10, with 1 being super easy, and 10 as the hardest level possible. Thus, select any level on the bike display that translates to the tension levels mentioned in this workout. Select degree of tension that fits with your individual level of fitness. On spin bikes, the displays usually show revolutions per minute (RPMs), which indicate your cadence or pedal speed. This workout suggests RPM ranges to follow, but this can be modified if necessary. Lastly, be sure to drink water during and between songs as needed. Each song requires a different level of intensity and variation of movement. There are 16 songs in total, which together add up to a 60-minute workout. “Something About You – ODESZA-Remix” by Hayden James, ODESZA (5:43). Find your base resistance or level of tension, which should be around a 5 on a scale of 1-10 with 10 being the heaviest or most difficult level possible. Note that this is based on your individual level of fitness and your own rate of perceived exertion. Perform the warm-up while seated. Aim for revolutions per minute (RPMs) to be between 80 and 90. This is an alternating leading foot song. The level of resistance should be at what is a 6 for you, and this is fixed throughout the song. RPMs should be between 85 and 95. Bike for 45 seconds with your left foot/leg actively pedalling and doing the work, while your right foot/leg passively follow. For the next 45 seconds, switch so that our right foot/leg lead. Repeat this again. For the last 45 seconds of the song, bike normally with both feet and legs exerting the same amount of force and working equally as hard. This is an alternating seated-to-standing song. For one minute, bike in a seated position with RPMs within the range of 50-55 at what is a level 7 for you in terms of difficulty due to the tension. For the next minute, bike in a standing position at a level 8 for resistance while maintaining the RPM range of 50-55. Repeat the seated part and the standing part once more. For the remaining 9 seconds of the song, you can start to lower the resistance in preparation for the next song. This song will be performed at a level 7. Bike at a fast (but not sprinting) speed for the non-chorus parts of the song with RPMs around 75-80. Then, for the parts of the chorus, sprint with RPMs between 105-110. This is a seated sprint song. Return to your base resistance level (the same amount of tension as the warm-up), which should be a 5 for you. This is a seated recovery, and RPMs should be between 75 and 85 for the entire song. This is a seated sprint song. Your level of resistance should be at a 6. For the entire time, you will sprint for 20 seconds followed by 10 seconds of recovery. Aim for RPMs to be around 105-115 for the sprints, and rest speed should be no lower than 80 RPMs. Resistance level should be at a 7. Throughout the song, you need to pace yourself and try to maintain RPMs around 75-85. You should be in the standing position for the whole song. This is a seated song, and the level of resistance is at a 7. For one minute, bike with the right foot/leg leading and the left foot/leg passively following. RPMs should be around 65-75. Switch legs for the next minute. Repeat this sequence for both sides once more. This is a seated song. You want to pace yourself, maintaining the same speed throughout. Your resistance level should be either at a 6 or 7. Try to keep RPMs around 100-105. This is a progressive, seated climb. Resistance level should be at a 7 for the first minute. With each minute, increase the resistance. Three minutes into the song, you should have reached what is a tension level of 9 for you. Then, for the last 39 seconds, return to level 7. Try to keep RPMs above 50 for the entire song. Resistance level should be at a 6, and this song involves seated sprints. Bike at a fast pace for the non-chorus parts of the song with RPMs around 80-85. For the chorus, sprint with RPMs between 105 and 115. Resistance level should be at a 7, and you will be standing throughout the song. Aim for RPMs to be approximately 55-65, and try to keep your speed constant from start-to-finish. Begin in a standing position with a resistance level of 8 and pedaling at a fairly quick pace for 30 seconds with RPMs around 60-65. Then, lower the resistance level to 6 and sprint for 30 seconds while seated with RPMs between 105 and 115. Repeat until you reach 3 minutes into the song. For the remaining 20 seconds, while standing and at a resistance level of 7, all out sprint to the finish line. Bring your heart rate down by pedaling in a seated position at your base level of resistance or lower. Resistance should be low enough so that you are still working a little bit but able to catch your breath. Song: Something About You – ODESZA-Remix” by Hayden James, ODESZA (5:43). Stretch all major muscle groups with moves of your choice. Be sure to pay attention to your hamstrings, glutes, quads and shoulders.